Sunshine is at 0% with 0.00 inches of rain today and calm-glassy sea. RAIN SHOWERS LIKELY. CLOUDY. HIGH NEAR 57, WITH TEMPERATURES FALLING TO AROUND 54 IN THE AFTERNOON. SOUTHEAST WIND 9 TO 14 MPH. CHANCE OF PRECIPITATION IS 70. NEW RAINFALL AMOUNTS BETWEEN A TENTH AND QUARTER OF AN INCH POSSIBLE. 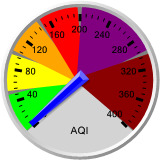 Coupevilleweather now has a registered Air Quality Sensor showing real-time air-quality data. If you enjoy this weather site please consider a donation to help support upgrades and maintenance. See more current conditions at WeatherUnderground.